1. The Maraval Taxi stand is located next to the KFC on the corner of Duke St. and Charlotte St.
2. The Taxi goes around the Savannah along Saddle Rd. to Maraval. Ask the taxi to stop at the 2nd road on the left after you pass the Ministry of Agriculture (Just before the Ellerslie Plaza traffic light). This is Newbold Street. Many drivers from town know it as ANYA AYOUNG CHEE’S HOUSE…you can also try mentioning that to help you get closer to the location upon arrival. 3. Walk down Newbold, take the 1st right which is Scott St.
4. On Scott St., walk 3 houses down on the right hand side, just after the South African Embassy. It’s the only 2-story building with aluminum gates. 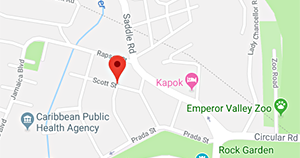 Scott Street to Port of Spain – Cost: $5.00 one way. 1. Exit the building and take a right, then the first right towards Ellerslie Plaza. Walk through Ellerslie Plaza to get to Saddle Rd. 2. Cross the Road towards the bus stop and look out for H cars or yellow ban maxi taxis. There are also P cars which go down Saddle Road, but you take them at your own risk. You just have to assess the driver (and passengers) as best you can and make a decision). Sometimes the P cars take you further down Charlotte Street so there is not so you don,t have to walk so much when you get to Charlotte. And then there is always UBER!